Sentimental Stones is finally back after a break this past year. We are beginning to get our online store open and stocked again, so continue to check back often for more items to view. At this time we are preparing for local fall and winter Artisan and Craft shows in the Spokane area and will update you with those event details on our Facebook page. Please visit us there for locations, times, and coupons to be used at those events. 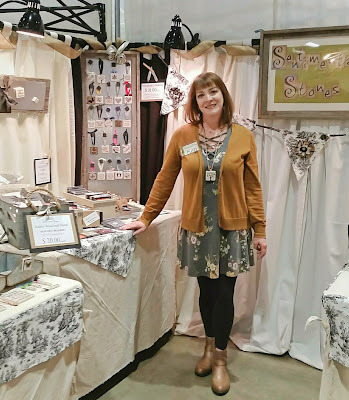 This photo of me was taken in our booth last fall and I was wearing one of our 2x2 inch charms as a pendant! It was a hit and shows how versatile some of our items can be. 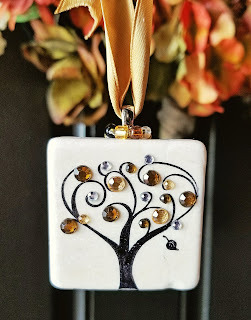 Check out the Autumn Radiance Tree in our Esty store. Enjoy the Splendor of the season!